Property Size 5,525 sq. 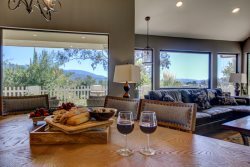 ft.
Stay at one of Temecula`s luxury wine country estates. Sangiovese Estate is complete with breathtaking views, pool, putting green, and all of the amenities one would expect from a true estate. Memories of a lifetime await. From the moment your friends and family arrive at the entry gates the signs of privacy, security, elegance and luxury abound. And the property will not disappoint. Having been well loved and maintained this property exudes quality. We invite you to look closely at the videos and photos to appreciate the marble floors, complemented by fine architect. Stroll the grounds, taste wine while enjoying the view or prepare a gourmet meal in the kitchen. On site event planner for any functions including: weddings,family reunions, strategic planning meetings and so much more! This is an amazing house with so many amenities to enjoy. The views are spectacular, even hot air balloons in the morning. Loved the pool table, spa, putting green, ping pong table. Perfect for our family of 7. The theater room was wonderful!! August 2018 Great Views!! The house is fabulous! So much room and the views are awesome. Their is also a lot to do, played pool, enjoyed the golf, ping pong and spa. We do recommend renting this house. May 2018 The house was great for our group! Very spacious, beautiful property. A few things were not in full working order (large theater room has a blue bulb out so the screen has a very green tint... sound also was not initially working but we fixed! ), and the water pressure in one downstairs shower was low. But overall a great space for a weekend away with friends! June 2018 We had a wonderful experience at this beautiful estate. The rental company was very accommodating. ★ ★ ★ ★ ★ We had a wonderful time at this beautiful home. The grounds were amazing with a great view. The beds were comfortable and the pool/spa were extremely clean. We all had a great time as we were in town for a wedding and were only 10 minutes or less away from great wineries and stores/restaurants. Cant wait to return! The house was beautiful and met our expectations in every manner. The open floor plan and amenities were perfect for our group. I love to cook and the kitchen was a dream along with the outdoor BBQ island. We needed a place for family and some of the wedding party to stay for my daughters wedding and it worked perfectly. It was the hottest day on record for July in Temecula and the air conditioning worked great. The master bedroom was incredible and the perfect place for the Bridesmaids to get dressed and do their make up. Cant wait to find another reason to go back! This house has lots of amenities and some of the directions on how to use need to to be updated but we were able to figure it out except for the WIFI. Book did not tell you which network to connect to and the password did not work for the ones that popped up, but that wasnt a very big deal. Kat was awesome and took care of everything we needed. I would highly recommend this house to all. You will not be disappointed!